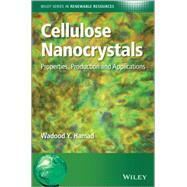 This book offers a comprehensive overview of nanocrystalline cellulose (NCC) and the development of advanced materials based on NCC for industrial and medical applications. The contents provide unique information on the physics, chemistry, biology and technology of NCC and NCC-based advanced materials, in addition to detailed coverage of the engineering aspects, addressing the challenges involved in nanomanufacturing on a large industrial scale. Contents include: A detailed treatment of the structure, morphology and synthesis of NCC. The science and engineering of producing NCC and how surface/interface modifications of NCC could lead to developing novel biomaterials with attractive structural and functional properties. The scientific bases for developing NCC-based nanomateials with advanced functionalities for industrial/medical applications. A detailed coverage of the eco-efficient engineering processes and technical modifications required for the potential manufacture of these functional bionanomaterials for applications such as packaging and utilization in heavy industries (e.g., automotives). This book is for audiences in the physical, chemical and biological sciences as well as engineering disciplines. It is of critical interest to industrialists seeking to develop new materials for the advanced industrial economies of the 21st century, ranging from adaptive "smart" packaging materials, to new chiral inorganic materials for pharmaceutical applications, to high-performance nanocomposites for structural applications.